Blog Quick Quotes: Heritage Page with Donna! Hello Quick Quotes fans, Donna here today and I would like to show you a layout of my dad. This is the only picture I have of him when he was a little boy. My dad didn't smile much so I always thought it was funny they called him "Sunny" but not until I much older did I realize it was spelled "Sonny", for son not the sun! 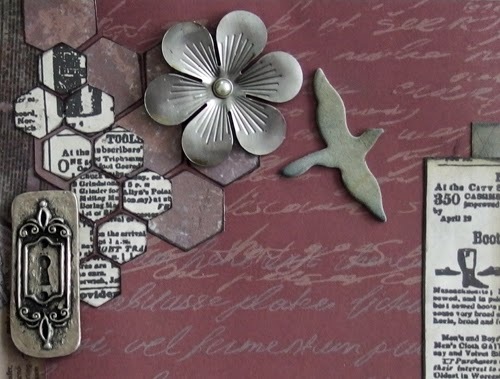 See how fabulous the metal flowers work with the Quick Quotes Alton line. I love Quick Quotes inks and use them on almost every layout. The bird I took Coal Miner ink and just dabbed it slightly until I got some shadows. The hexagons are inked around the edges. Designer tip: Layer it! Layering under a picture and even different size shapes can have a dramatic effect. I have four layers on the picture. I like to do this to make the smaller picture look larger on a 12x12 layout. I took two sizes of hexagons and layered them as well. Other Products: Misc. 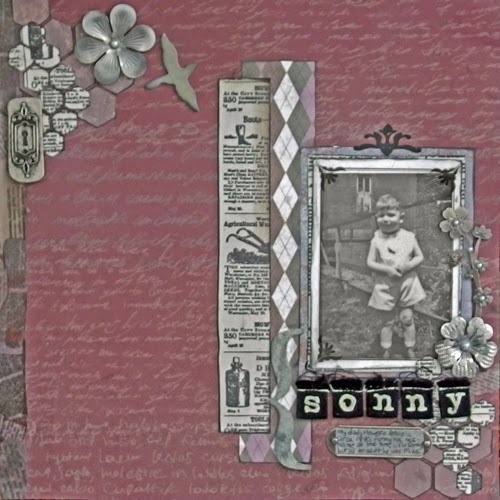 chipboard, brads, bling, metal pieces, Carolee's Love Lorn Alphabet, Recollections tape. Thanks for stopping by Quick Quotes.